Nonimmigrant visa – for temporary visits such as for tourism, business, work, visiting family, or studying. 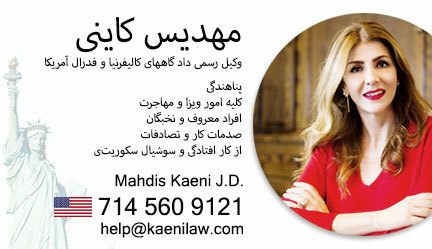 Kaeni Law Group’s philosophy is providing people with honesty, integrity, excellent customer service with over 45 years of combined experience. We believe that communication with our clients is essential and the reason so many people refer us to their family and friends when they need an honest, experienced and resourceful lawyer. We accept Immigration, accident and personal injury cases of all sizes, and give each one the full support and personal attention of our legal staff. We follow every reasonable lead, hire the best available experts, and utilize the most updated and innovative technology to give you the edge over the opposition. Our secret is thorough case preparation and attention to the smallest details pertaining to each case. That’s why most of our cases are favorably settled out of court without going to trial.